Boyd K Packer | Life, with a click! It’s never what I expect, and today is no exception. I miss 2nd ward traditions, I wanted to see our little Primary singing, etc. Our new ward is starting to feel less strange, but I still miss our old ward. It’s apparently about a 4 year long recovery time and we are 4 weeks in. I’ll make it. Spring of 2013 I was dealing with The Very Hardest of Hard Things and was very traumatized. Up didn’t seem like up and for a week or so I was surprised each morning when the sun came up. I had no grasp on reality, but I knew that Christ knew me personally and believe that his heart ached with mine. I’d had a priesthood blessing from my Bishop and I know he cared, but I felt very alone and very scared. My prayers had very few words, lots of sobs and tears filled with emotions that there aren’t words in the English language to describe. I’m not certain how that week ever ended, but it did as the Hard Things continued to pour forth. I acutely felt the lack of priesthood guidance in my home, as well as a partner or helpmate to get me through. 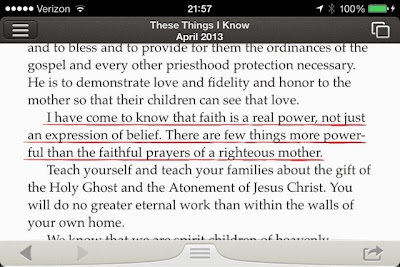 A few weeks after that very first night was General Conference. I remember so many details of that conference, the feeling of the blanket on my lap, my snacks, the smell of breakfast, my little TV with crappy signal, the pajamas I was wearing. Boyd K Packer gave his talk These Things I Know and in that talk are two great truths I needed to understand. I have come to know that faith is a real power, not just an expression of belief. 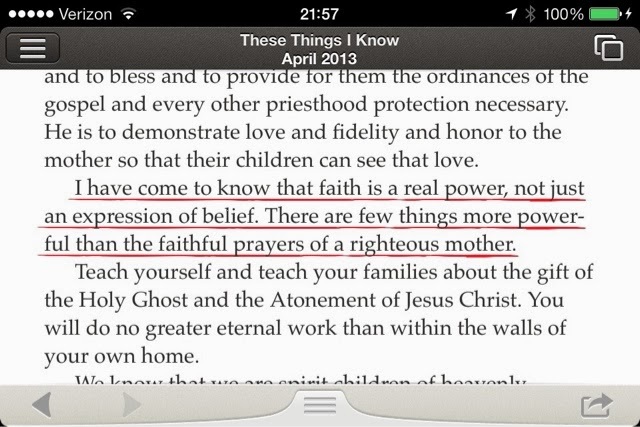 There are few things more powerful than the faithful prayers of a righteous mother. Things are different now, We are dealing with Hard Things 3: Cancer, Again. instead of Hard Things 2: The Very Hardest of Hard Things The kids are older (easier and harder all at the same time) and I’m not alone (but at times I still feel very lonely and afraid) and in some ways they are the same. That first week feels like an alternative reality, and I’m not certain how it ended. I’m not sure what I’m suppose to learn this time, but I’d like to learn it so we can move on to a chapter I’d like to call After Hard Things Life is Grand but I don’t know that my life gets that chapter, so I’m working on finding grand things in the midst of Hard Things. Life feels very uncertain for me right now, but I know Christ understands me, and he knows what it’s like when I’m paralyzed with fear and uncertainty. God does answer every child’s prayer, and not just all those other prayers but my prayers too. I believe in the power of believing. What I wish I knew is where all of that is going to leave me, but for tonight I pray in sobs of uncertainty and fear knowing that there is power in that prayer.